Enjoy the luxury of leather at an affordable price when you choose the Wind Loveseat. This cozy settee will grace your lounge or office with stately executive style. Global Wind Reception Seating will give a warm welcome to everyone who enters your office. 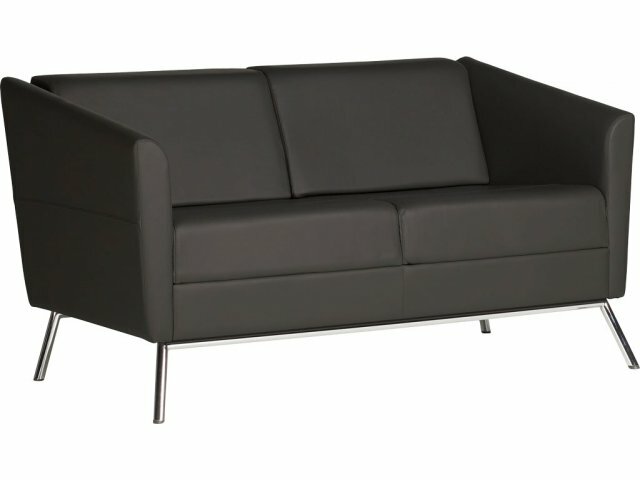 Its attractive combination of simple geometry and slim proportions is especially conducive when space is at a premium. These club chairs, sofas and loveseats will keep your guests comfy without crowding the waiting room. The unique design of this reception seating will give your lobby an open and spacious feeling. It is functional and appealing, and offers some excellent options. Durable tubular steel bases complement the upholstery, provide easy access for floor cleaning and give your space an open feel. 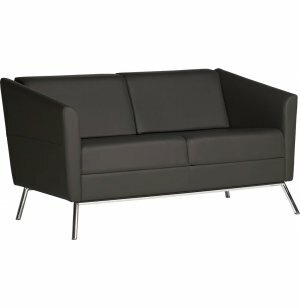 Classy upholstery choices let you coordinate with reception furniture in various styles and colors. Budget Friendly: Upholstery features a leather/mock leather combo which provides the appeal of real leather at an affordable price. Space Saver: Slender profiles fit into tighter spaces and take up less room. Open Style: Supported by elevated tubular steel bases for a light, airy feel and easy floor cleaning. Classy Comfort: Fully-upholstered fixed cushions let your guests sit back and relax. Full Collection: Choose from matching sofa, loveseat, club chair and coffee table for total coordination.